Filed under commodore on July 26, 2017. I’ve been reminiscing about my first computer, the Commodore VIC-20, since deciding my first work of fiction will take place during the 1980s. During a hot July weekend in 2017, I decided to scratch my retro computer itch and check eBay for a Commodore VIC-20 listing. The listing found at the bottom of this post, by seller vector98, caught my eye. I entered a max bid of $150 and was happy to learn at the end of the weekend that I had won the auction for $145.50 plus $59 shipping. Never heard of the Commodore VIC-20? Hear what “The Shat” has to say about this computer in the 1982 commercial below. Although the seller listed the VIC-20s “for parts only,” I believed that from the four, I could get at least one working. I waited patiently for them to arrive at my door three days later. I have to give kudos to the seller. The computers, software and peripherals were lovingly packed and everything was as advertised. After an unboxing and close inspection of the contents, I believed I found a solution to the non working computer problem. The use of an RCA to coaxial cable adapter got me 50% of the way through my troubleshooting. Within thirty minutes, I had two VIC-20s working, one almost working (some fuzzy video that I think I can adjust), and one that likely is completely dead (I need to put a volt-ohm meter on it to confirm). This “dead” VIC-20 is in horrible shape complete with cracks, yellowing, missing keys, etc. So of the four, I believe the two I have working can be restored to very good condition. The one that is “almost working” I can likely restore to fair condition through troubleshooting and/or cannibalizing of parts. The last non-working computer will serve as a source of parts. All VIC-20s have dirty interiors. The first step will be to completely clean both the inside and outside of the computers. My second step will be to whiten the cases as they are all yellowed. In the third and final step, I will repair several loose connectors on the main boards by re-soldering the leads. I plan to display one working VIC-20 in my home office and another working VIC-20 in my college office. The broken VIC-20, that I’m not actually sure I can get running, may be gutted. I will then install a Raspberry Pi 3 and use the original keyboard as the input device. With the Raspberry Pi 3 replacing the original motherboard, I will bring the VIC-20 back to life using the wonderful Combian 64 Linux distribution that boots directly to the VICE Commodore emulator. Using this Linux distribution the newly enhanced VIC-20 can emulate any one of many great early Commodore computers including the VIC-20, PET, 64, Plus/4 and even the 128. I am happy to know that I will be able to restore at least a couple of these computers from what was considered to be four “parts only” computers. I look forward to returning to my glory days of computing and experiencing what made Commodore VIC-20s so magical during the 1980s. As I continue this project, I’ll do my best, time permitting, to share my experiences and the tips and tricks I learned along the way. If you have tips for me, please drop them in the comments section, below the eBay listing, below. 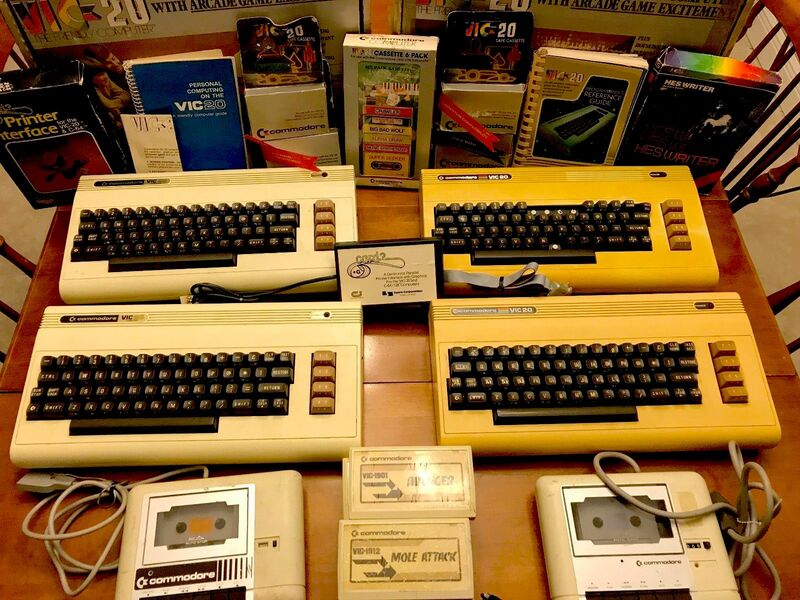 Up for auction is largely a parts or repair lot of Commodore VIC-20 stuff. I want to be very clear, this strictly is for parts or repair. Below I will describe conditions to the best of my knowledge, but the entire lot should be considered for parts or repair. I’m mostly a Commodore 64/128 guy and I’m liquidating all of my excess VIC-20 stuff. I don’t have enough knowledge to quickly repair the VIC-20 line and I just keep one for the “collection” and hope someone else will find enjoyment out of the rest. This is a $9.99 no reserve plus calculated shipping auction to help me clear out my house and move on to the next project. The $10 is really just to cover the time and packing materials. I’d rather this stuff go to an enthusiast rather than a thrift store or recycler. 2x Original VIC-20 Boxes. One is in fair shape, the other is in poor shape, but the Styrofoam and cardboard box for the accessories are there in both boxes. Two of the older style with the 2-pin power connector, and 2 of the newer style with the round power connector. One of the newer style’s keyboard is missing several keys. They all power on and light the red light, but produce black video. One of them occasionally produces scrambled colors on the screen, but not always. The one with the missing keys has some sort of modification done with a plug on the back and a jumper wire. This is a 24 x 18 x 18 heavy duty box packed to the gills with nearly 55 pounds of VIC-20 stuff and packing materials. I filled as many voids as possible of the VIC-20 original boxes with the extras. Remaining extras and computers are wrapped in ESD bubble wrap and brown packing paper makes up any other slack in the box. Great care was taken to ensure this arrives in similar condition that it leaves in. Not counting the trip to Lowe’s for the box, it took an hour to pack this stuff! This will have to ship UPS ground. I will ship it for exactly what UPS charges me to do so. I presume the eBay calculator is fairly correct, but if you want a guaranteed quote ahead of time, message me and I will check it manually. It is boxed, packed, and ready to go. It will ship out within two business days of receipt of payment, typically the next day. A note about shipping costs for your consideration: I am a hobbyist/enthusiast of vintage computing, not a commercial endeavor. All items are packed very carefully using packing paper, ESD bubble wrap (where appropriate), and USPS Priority Mail packaging when possible.